This article is about the English actress. For the alleged Soviet spy, see Ruth Wilson Epstein. For the missing person, see Disappearance of Ruth Wilson. Ruth Wilson (born 13 January 1982) is an English actress. She is known for her performances in Suburban Shootout (2005), Jane Eyre (2006), as Alice Morgan in the BBC TV psychological crime drama Luther (2010–2013, 2019), as Alison Lockhart in the Showtime drama The Affair (2014–2018), and as the titular character in Mrs Wilson (2018). Her film credits include The Lone Ranger (2013), Saving Mr. Banks (2013), I Am the Pretty Thing That Lives in the House (2016), and Dark River (2017). Wilson is a three-time Olivier Award nominee and two-time winner, earning the Best Actress for the titular role in Anna Christie, and the Best Supporting Actress for her portrayal of Stella Kowalski in A Streetcar Named Desire. She has won a Golden Globe for her role in The Affair and received nominations for a British Academy Television Award for Best Actress and a Golden Globe Award for Best Actress – Television Series Drama for the title role in Jane Eyre. Wilson was born in Ashford, Surrey, the daughter of Mary, a probation officer, and Nigel Wilson, an investment banker. She has three older brothers Toby, Sam (a BBC journalist) and Matthew, and is the granddaughter of novelist and MI6 officer Alexander Wilson and his third, bigamously-married, wife, Alison (née McKelvie). Her great-grandmother was Irish. Wilson grew up in Shepperton, Surrey, and was raised as a Catholic. Wilson attended Notre Dame School, an independent Catholic school for girls located in Cobham, before attending sixth form at Esher College. As a teenager, she worked as a model, and went on to study history at the University of Nottingham, graduating in 2003. While at Nottingham, she was also involved in student drama at the Nottingham New Theatre. She graduated from the London Academy of Music and Dramatic Art (LAMDA) in July 2005. Afterwards, she co-founded Hush Productions. During her time at Nottingham, she participated in the TV war strategy game Time Commanders, helping her teammates fight in the Battle of Pharsalus. Prior to her role in Jane Eyre, Wilson had one professional screen credit, in Suburban Shootout, a situation comedy she starred in with Tom Hiddleston. In 2006–07, she filmed the second series of Suburban Shootout, a new Agatha Christie's Marple mystery (Nemesis) for ITV, and Stephen Poliakoff's BBC television drama Capturing Mary as the young Mary. In 2007, Wilson appeared in Gorky's Philistines, playing Tanya, at the National from May until August. In June, she presented the 2007 Lilian Baylis Awards. Other projects in 2007 included a guest appearance in the sitcom Freezing as Alison Fennel (transmitted on BBC2, 21 February 2008); narration of the documentary The Polish Ambulance Murders (transmitted on BBC4, 5 February 2008); and the portrayal of a mentally ill doctor in the dramatised documentary The Doctor Who Hears Voices (transmitted on UK Channel 4, 21 April 2008). From 23 July to 3 October 2009, she appeared as Stella in the Donmar revival of A Streetcar Named Desire. On 15 November 2009 AMC Television and ITV premiered the 2009 TV miniseries remake of The Prisoner, in which Wilson played the Village doctor, "Number 313." She played "Queenie" in an adaptation of Andrea Levy's Small Island, which aired on BBC1 in December 2009 and also aired in the United States on PBS in 2010. Since 2010, she has appeared in the British psychological police drama Luther as Alice Morgan, a research scientist and highly intelligent sociopath. In September 2012, the series' creator, Neil Cross, announced that he was in the process of creating a spin-off of Luther centred on Wilson's character, though as of 2018 this has not happened. Cross stated, "The BBC is very interested in the project. The only real question would be how many and how often we would do it – whether it would be a one-off miniseries or a returning miniseries, a co-production or not." While Wilson could not appear in series four of Luther due to filming clashing with The Affair, she is confirmed to be returning for series five. From 4 August to 8 October 2011, Wilson starred in the title role of Eugene O'Neill's Anna Christie at the Donmar Warehouse alongside Jude Law. Her performance prompted The Guardian to devote an editorial to Wilson's "courageous, edgy and compelling talent". In 2014, Wilson began starring as Alison Bailey on The Affair, for which she won the Golden Globe Award for Best Actress – Television Series Drama in January 2015. The show has now run for four seasons. On 5 August 2018 it was reported that Wilson was leaving the show by her own choice. Her film I Am the Pretty Thing That Lives in the House, directed by Oz Perkins, premiered at the 2016 Toronto International Film Festival. From December 2016 to February 2017, Wilson starred in the title role of Hedda Gabler in a new version by Patrick Marber at the Royal National Theatre. The production, and Wilson's performance in particular, received critical acclaim. In November 2018, Wilson starred as the title character Alison Wilson, her real grandmother, in the BBC drama Mrs Wilson. Alison Wilson was the third of four wives of former MI6 officer and novelist Alexander Wilson. They were married for 22 years. After his death in 1963, Alison discovered one other wife with whom she collaborated on the funeral. In order not to create extra shock for his children, the other wife and her children attended the funeral as ‘distant relatives’. Alison died in 2005 without knowing he had two further wives. Ruth Wilson explains in a December 2018 Radio Times interview that the script for the series that showed Alison uncovering all of the wives was dramatised in order to reveal the full story during the series. 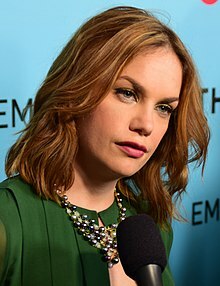 Ruth Wilson was also an executive producer for the series. 2003 Time Commanders Herself Episode: "Pharsalus"
2007 Agatha Christie's Marple Georgina Barrow Episode: "Nemesis"
2008 Freezing Alison Fennel Episode: "#1.2"